Don’t settle for store-bought packets of gravy. Set the tone for an unforgettable Thanksgiving with a simple, but memorable, turkey gravy. 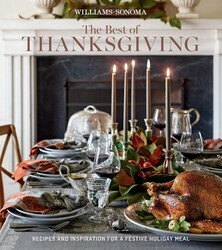 From Williams-Sonoma: The Best of Thanksgiving. Place the roasting pan with the pan drippings on the stove top over medium-high heat. Pour in ¾ cup (6 fl oz/180 ml) water and bring to a brisk simmer, stirring with a whisk to scrape up any browned bits on the pan bottom. Simmer until the liquid is slightly reduced, about 1 minute. Carefully strain the contents of the pan through a fine-mesh sieve into a heatproof bowl or a fat separator and set aside. If the drippings are in a bowl, spoon off as much fat from them as possible. In a saucepan pan over medium heat, melt the butter. When it bubbles, add the flour and cook, whisking constantly, until the flour is golden brown, 2-3 minutes. Slowly whisk in the degreased drippings from the bowl or from the fat separator, leaving the fat behind in the separator, if using. 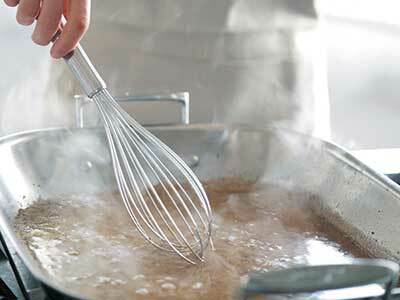 Whisk in the stock and the demi-glace, if desired, and cook, stirring constantly, until the gravy is smooth and thick enough to coat the back of a spoon 2–3 minutes. Stir in the sherry, if desired, and season with salt and pepper. Pour the gravy into a warmed gravy boat for serving. Thanksgiving is a cherished time to gather around the table for a feast with family and friends. The traditions surrounding this American holiday are boundless, reflecting personal style and a diverse range of dishes. But it can also be daunting, whether you prepare and host each year, or are new to the experience. With an abundant and diverse collection of over 80 recipes, The Best of Thanksgiving is the solution to creating a delicious and welcoming meal with ease. Williams-Sonoma's culinary legacy began in 1956, when Chuck Williams founded his original cookware shop in the California wine country town of Sonoma. The store offered a collection of classic French kitchen equipment that many Americans had never seen before. And it immediately became a favorite of home cooks and professional chefs alike. Since then, our brand has expanded to include hundreds of exclusive products from around the world, more than 250 stores nationwide, millions of direct-mail catalogs, an award-winning e-commerce site – and one of the world's best-selling cookbook libraries. One essential factor remains unchanged: Williams-Sonoma's enduring commitment to the finest quality and outstanding customer service.